Hon. Jason Kenny on government, civil society, and the common good. On May 17, 2018 over 200 guests joined Cardus at Calgary’s Glenbow Museum to hear the Hon. 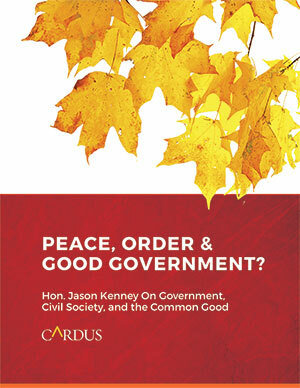 Jason Kenney provide a thoughtful perspective on the role of civil society. Patrick Nixon, Executive Director of Oxford House, and Jennifer Gerson, Journalist-in-Residence at the University of Calgary, then joined Kenney in conversation.